Greetings fellow music lovers! It’s Andy Gesner and the staff here at HIP Video Promo with the hottest female artist on the planet. British-born Lady Sovereign starts out by cheekily quoting J-Kwon and then slips into her dancehall-inspired flow over a track that marries the feel-good hip-hop of the 80’s with something so fresh and so now. “Random” bridges US crunk and hip-hop with UK grime delivered with a humour, charm and ability that only Missy Elliot could compete with. That’s why this pint-sized emcee is the odds-on bet to become one of the biggest stories in contemporary music in 2006. But don’t take our word for it. Take it from somebody who ought to be able to judge a great rapper: the legendary Jay-Z. After sending some spies to one of her New York gigs last Summer, Sovereign was flown back to NYC by Jay-Z, and shortly afterwards he signed the 20 year-old, 5ft 1”, self-described “big midget” to the Island/Def Jam/Rocafella family. He is now A&Ring her debut LP Public Warning, having lined-up some of the world’s greatest producers for her to finish off the LP with, which is due out in Summer 2006. TheVertically Challenged EP, her debut US release emerged on Chicago’s Chocolate Industries in late-2005 as negotiations with Def Jam were still taking place, and was an immediate Internet sensation, burning down web-blogs from Brixton to Williamsburg. The cognoscenti are already mad for the girl and her music. Spin named “Random” one of the best singles of 2005 – even though it hadn’t yet dropped in America. Rolling Stone has named the S.O.V. “one to watch” and reported that she “has all the makings of a hip-hop superstar”, it is this wave of excitement and expectation that has already landed her the covers ofUrb, Fader, Venus and I-D magzines. The director of the “Random” video, Chris Cairns, won the coveted “New Director of the Year” Award in Britain in 2005 for his work with Lady Sovereign. 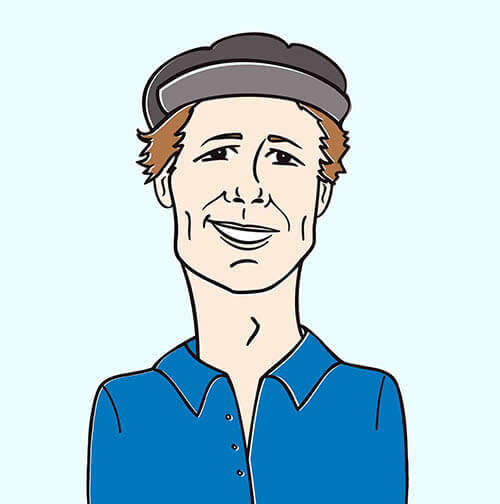 Chris has also shot videos for Thom Vek and LCD Soundsystem, and, as anybody who has seen his celebrated clip for “Daft Punk Is Playing At My House” can tell you, he’s got an affection for LED lights and electric streaks and strobes. He makes the faders on a mixing board and the levers on an EQ rack dance and pulse to the music, sliding open and shut like a mouth; he flashes blue-green lightning between Lady Sovereign’s lips. Behind the emcee, human figures rush by in a blur – from time to time, the camera captures on one or two, drawing their faces into sharp focus. In the most evocative shot in an extremely evocative video, Cairns rings the S.O.V. with halos of blue light – physical manifestations of the electricity she generates. But Sovereign is the star of this show. She commands the camera like the budding superstar she is. Never taking herself too seriously despite the serious hype that surrounds her name. Here at HIP we are ecstatic to be working with Seven, Chocolate Industries head spokesperson and Evan Prager at Island/Def Jam Records to bring you this mesmerizing clip! We have copies of Vertically Challenged for on-air giveaways, along with Lady Sov stickers and buttons. And when she next comes to the US to finish her album she is committed to sitting down with as many of you as possible for interviews! If you need more info, call Andy Gesner at 732-613-1779 or e-mail us at info@HIPVideoPromo.com . 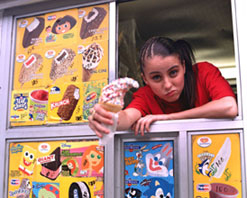 You can also visit www.ChocolateIndustries.com or www.LadySovereign.com to find out more about this up and coming superstar!